As much as a third of new development in the United States relies on decentralized wastewater treatment. Such systems pose a threat to shorelines and drinking water. They can also allow development to occur in places and at densities that are in conflict with a community's vision for its growth. This report explains how planners can address wastewater treatment to help their communities meet goals for growth and protect drinking water and other natural resources. 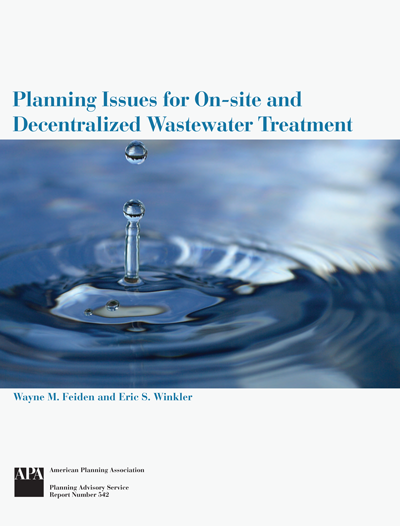 The authors, a planning director who has helped design more than 2,000 wastewater systems and a professor of plant and soil sciences, present a balanced, insightful, and technically rigorous explanation of how these systems need to be sited, designed, and managed.